This week we have been learning about the parts of a plant and those that we can safely eat. We have examined a variety of fruits and vegetables and realised that we eat flowers, stems, leaves, seeds and seed pods, roots and tubers! All very exciting! 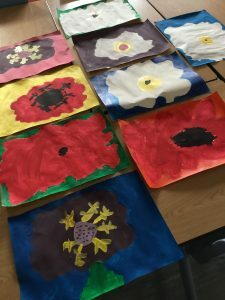 We have looked closely at flowers and painted them as though magnified in the style of Georgia O Keeffe.